This is currently one of my favourite photos. I just love chinese barbecued meats. Lunch 09/08/2005. Large barbecue combination from our local shopping centre’s food hall, AU$8.80. Three meats, L-R: roast duck, roast pork (siew yoke) and barbecue pork (char siu). Served with steamed rice and bok choy, with duck gravy poured over the top. Each piece of roast pork had a layer of meat, a layer of fat and a layer of crackling… really good. The barbecue pork was just how I like it – really dark. Exactly what I was craving today. I left a clean plate with a small pile of thoroughly sucked duck bones. I’m sure if any passers-by took a moment to watch me eating they would’ve been disgusted. Damn that duck skin is good. I should’ve had a large combination, which comes with four meats. Then I would’ve had roasted herb chicken too… more meat and more skin, mmmmmm. 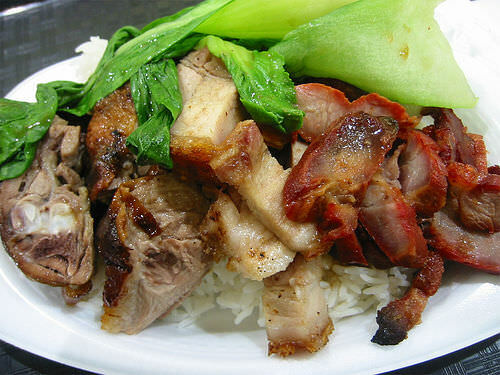 When I shared a flat with my eldest sister in the early to mid 1990s, something we liked to do was go across the street to the Hong Kong Barbecue House and get takeaway dinner: barbecue pork and rice for me and roast pork and rice for her. It cost us AU $4.50 each, and came with freshly fried choy sam. One or both of us would order the food and wait while it was being prepared. I loved watching the meat being grabbed off the hooks hanging in the front window and cleaver-chopped into pieces on the wooden chopping block, and I would get even more hungry smelling the choy sam being fried. And you know that sound of the metal wok spatula on the wok? That is one of the best, most appetite-whetting sounds.